last post as Guest Designer with the fabulous SNSS team this month! with some engagement congrats cards! colored them with copics and then cut them with the Love Birds Die Set. stencil and Ranger Distress inks Spun Sugar and Evergreen Bough. add a large Congratulations to the Love Birds. shorter ones, and script with plain fonts. SNSS team for inviting me to join them this month - loved it! 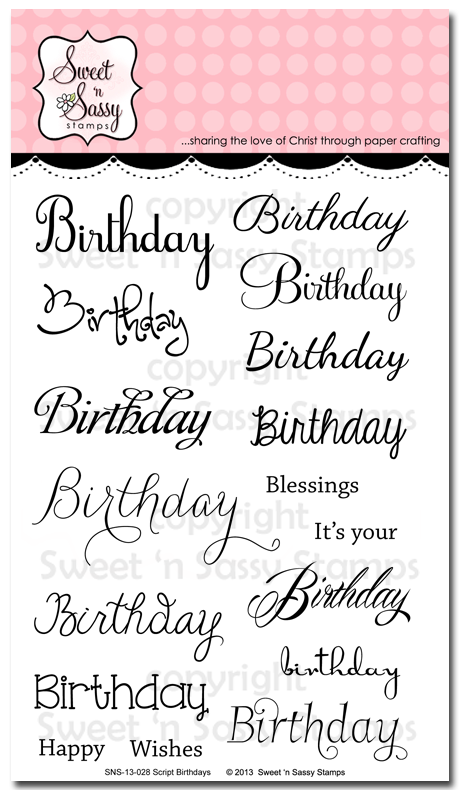 I have a CAS card to share today that you can use for any occasion depending on the sentiment you use. I have chosen to make mine a thank you card but the ladies at my card class that I taught this at chose to make theirs into birthday cards. 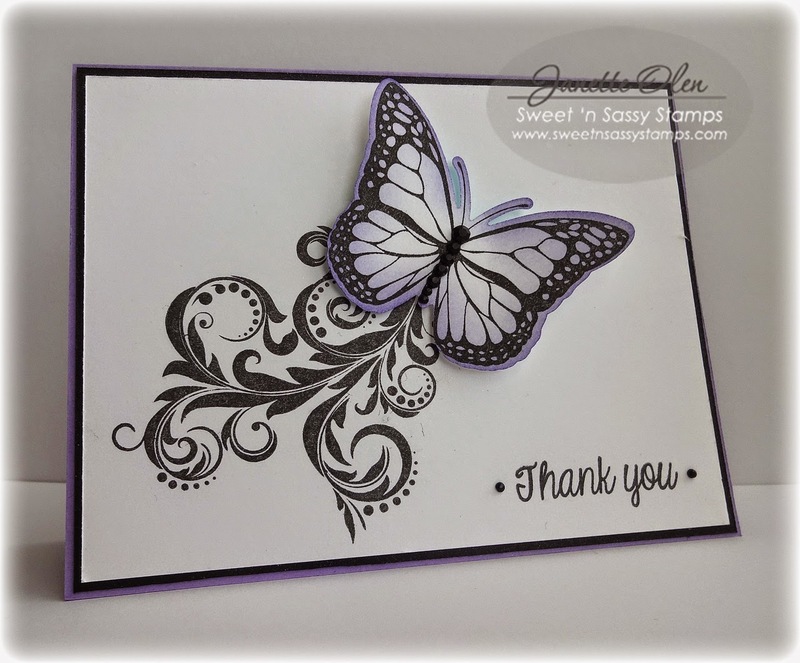 I die cut the butterfly and sponged the edges with ink and then stamped my butterfly with black ink. I stamped the flourish for the butterfly trail and adhered my butterfly with foam tape and accented the body with black rhinestones. I stamped the sentiment in the lower right hand corner and all finished. This would be an easy card to mass produce as well. Thank you so much for stopping by, have a blessed day! It's Ceal here to share another tutorial with you. As you know ombre stamping is all the rage right now. Hero arts has those cool Ombre inks but what if you are like me and don't have those inks? I am going to show you how to get the look with inks you may currently have. 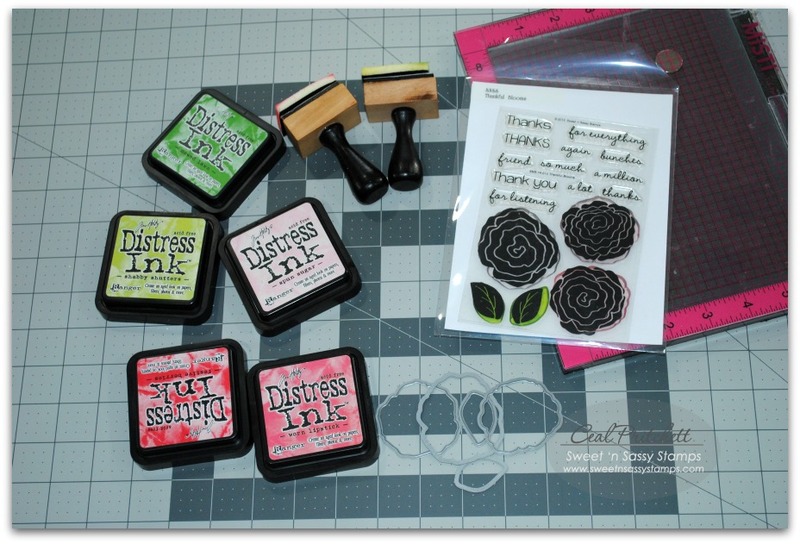 I am using Tim Holtz distress inks but any dye inks in contrasting colors will work. For the roses I used, Spun Sugar, Worn Lipstick and Festive Berries. The leaves are done in just two different greens, Mowed Lawn and Shabby Shutters. 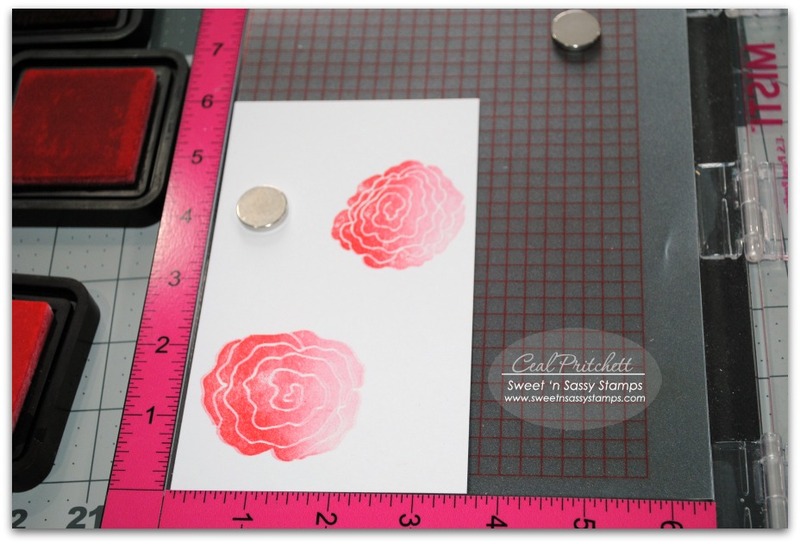 I also used my MISTI tool, which made it so easy to do this technique because you can stamp in the exact same place over and over. To start you will need to take your darkest color and sponge the top of your image, next the medium color and sponge starting at the top, going down a little over half way. The last step is to take the lights color and sponge the entire image, by sponging in this manner it gives you that ombre effect. If the colors aren't dark enough you just keep sponging putting more at the top ect, until you get the look you desire. I sponged the leaves the same way, with the darkest color at the bottom and the lightest color over the entire image,this gives you that middle color. The set I used Thankful Blooms is perfect for this technique. 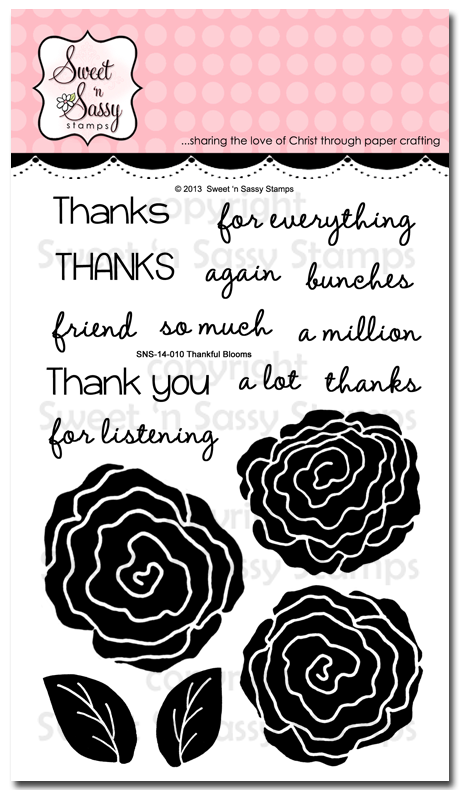 I also used the coordinating dies Thankful Blooms die set . For the greeting I used the Precious Poppies set. Happy Sunday, friends! Wishing you a most blessed day! Kim here, sharing a summer-themed card because I am longing for warmer weather. Those of us in the northeast are still waiting...LOL! 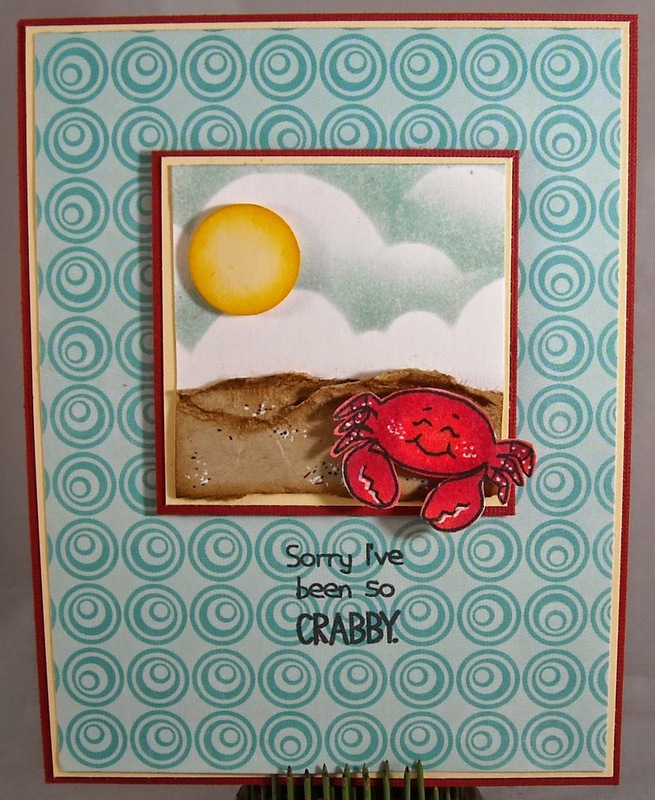 This is a sweet little card I created with the darling Happy Ocean Friends stamp set. 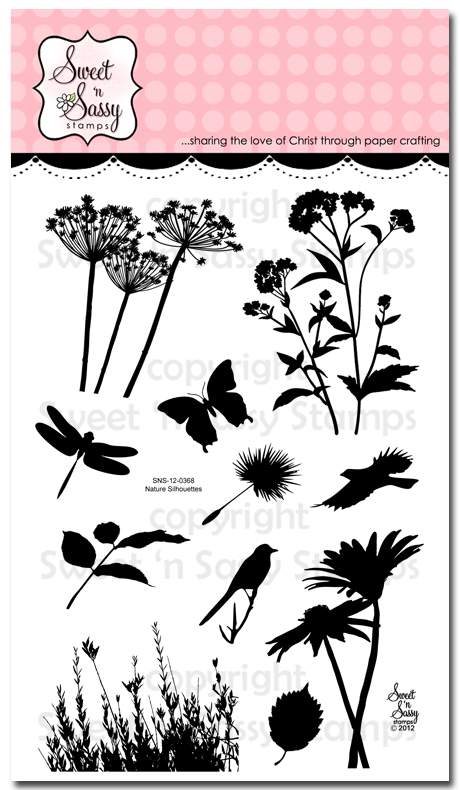 I love all things beachy and I adore the sweet critters that are included in this set. Good morning Sweet'nSassy friends! 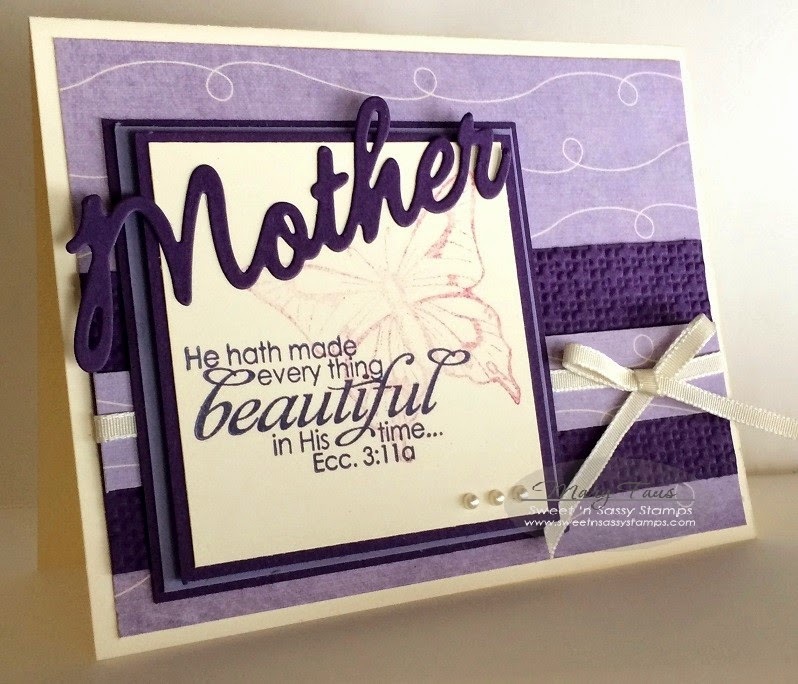 Mary here to share with you a card I created using the Mother Word die. It is on the discontinued list, I encourage you to grab one before it is gone. The scripture is from the New Creature set. More samples of this die on my Blog. Have a beautiful Day! Hello Sweet Friends! Happy Friday…and it will be a happy Friday for two lucky winners from our SNSS April 2015 Release Blog Hop! Love the sentiment with this sailboat…perfect for any special young man! April and Donna, please send an e-mail to korin@sweetnsassystamps.com to claim your $10 gift code. If you received Korin's e-mail on Tuesday, you already know that Sweet 'n Sassy Stamps has cancelled the Sweet Perks Club as well as the new release for the month of May. 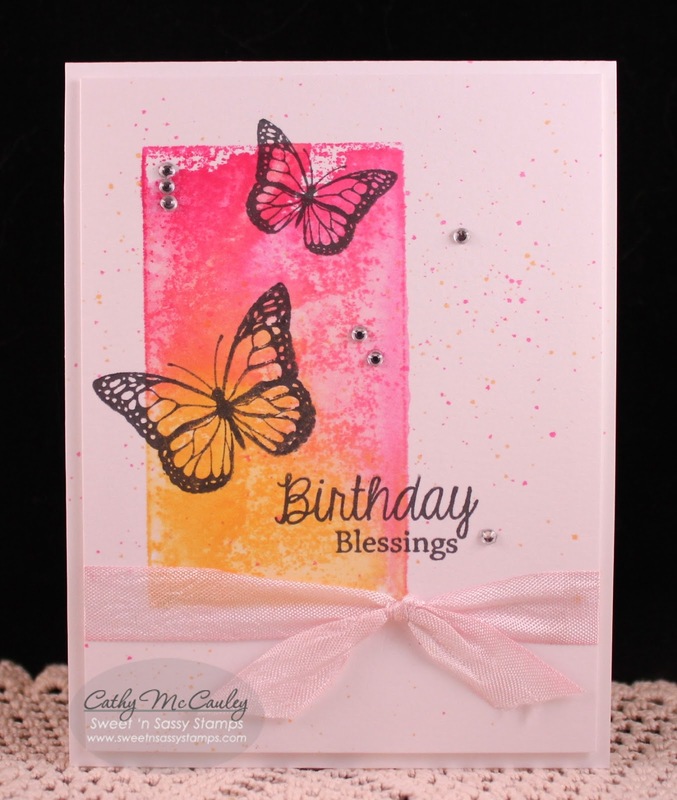 Be sure to tune in daily as we will be featuring some of our most popular stamp sets and dies. You won't want to miss any of the fun or any of the fabulous creations by the Design Divas! To start things off, I have 3 "Clean and Simple" cards to share with you today. We have a Women of Purpose Ministry at our church. One Saturday a month some of the more "mature" ladies of the church share their talents and gifts with the younger ladies. 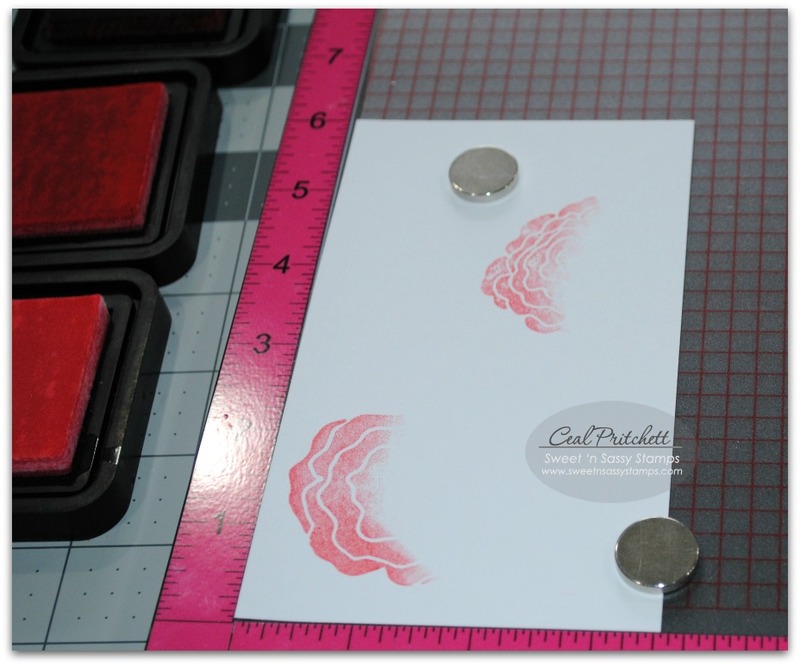 It is my turn to share tomorrow, and of course we will be stamping. Since some of the ladies have never stamped before, the cards we will be making are very CAS. The first card was inspired by the talented Bridget Finlay who is a master of "Clean and Simple." Her inspiration card can be found HERE. One of the images from the Nature Silhouettes stamp set was stamped twice in opposite corners using the "Second Generation" stamping technique. The sentiments are from God's Purpose. 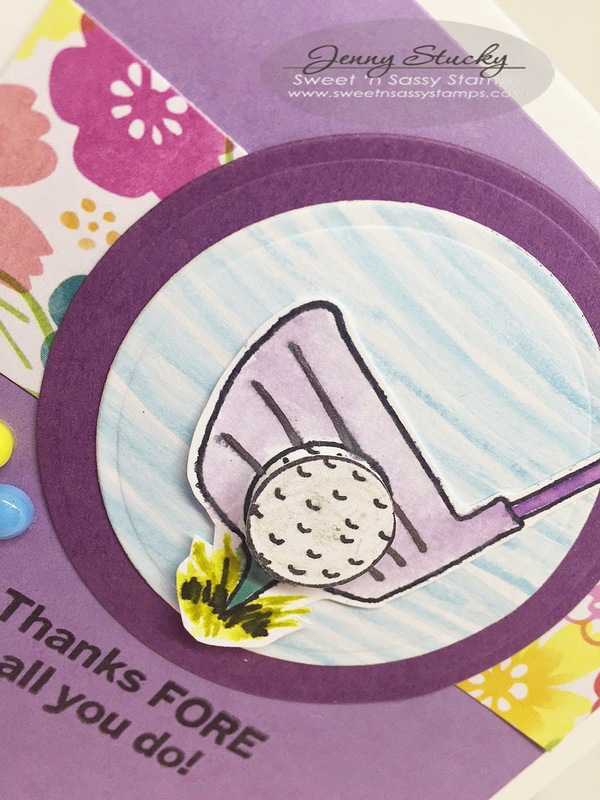 Some gingham ribbon and a few pearls finish the card. 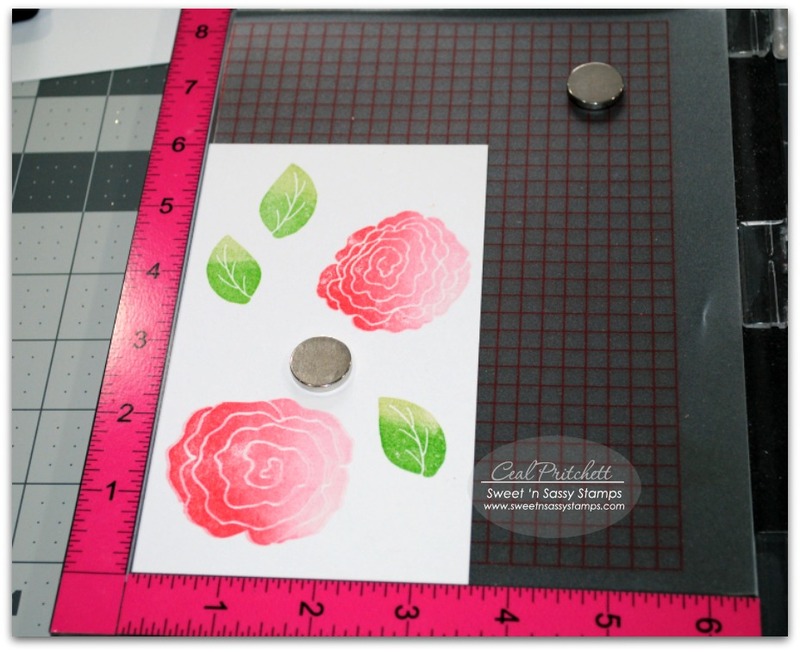 To create the background, Rose Bud and Cantaloupe Memento Inks were rubbed onto an acrylic block, spritzed with water, and stamped directly on a piece of Mixed Media paper. This was done twice to intensify the color. 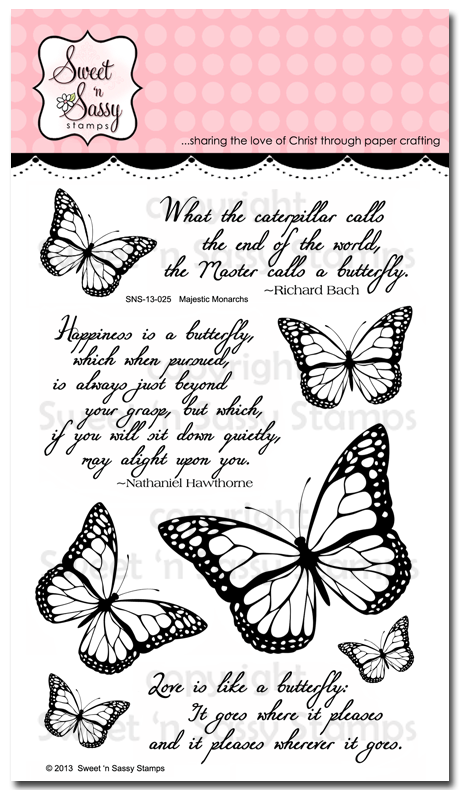 The Majestic Butterflies and the sentiment from the Script Birthdays stamp set were stamped with Watering Can Archival ink. 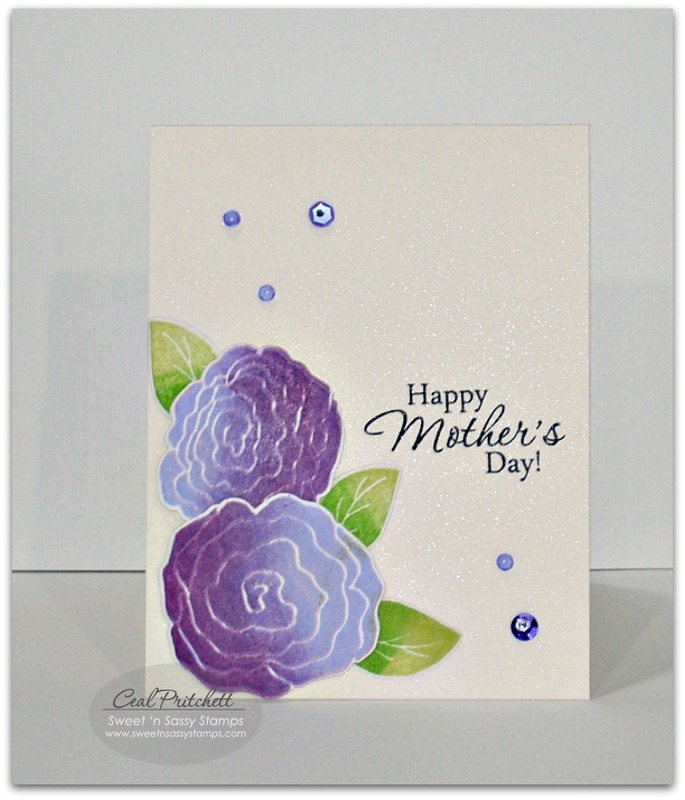 A few splatters and some rhinestones finish the card. Any dye based ink will work for this technique. The final card was made by sponging Memento Inks through a negative mask to create a circle in the center of the card front. A script stamp was used to add interest while the mask was still in place. The woodland scene from Landscape Silhouettes was also stamped using Versafine Onyx Black ink while the mask was in place. The mask was removed and the sentiment was stamped. Twine, a button, and some pearls finish the card. The stamps used to make this card are not available at this time. Thank you so much for joining us today! We so appreciate all of you and hope you've enjoyed your visit! Have a blessed Friday! Hi Sweet 'n Sassy friends, it's Ceal here to share with you today. With Mother's day being only a couple weeks away, I had to get started on my Mother's Day cards. I usually send out at least 10 or more Mother's Day cards, do I have that many Moms, of course not. I lost my Mom when I was in my 20's and since then I make and send out cards to those who have lost their Mom within the last year and this is their first mother's day without her, because it's hard. 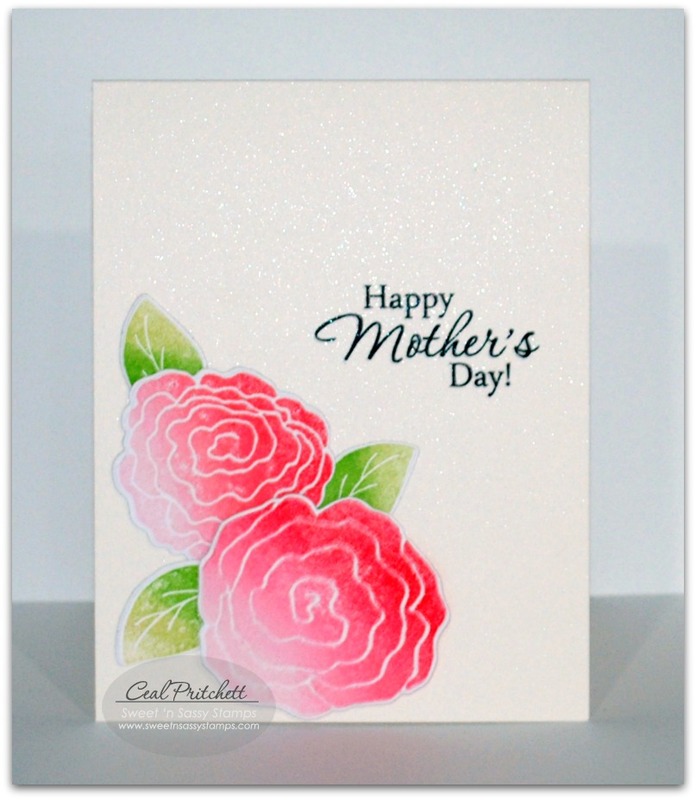 For this card I used the Precious Poppies set, one of my all time favorites of Sweet 'n Sassy Stamps. I embossed the image with white embossing powder and then colored over the white with Copic markers, only to leave just a touch of white showing. 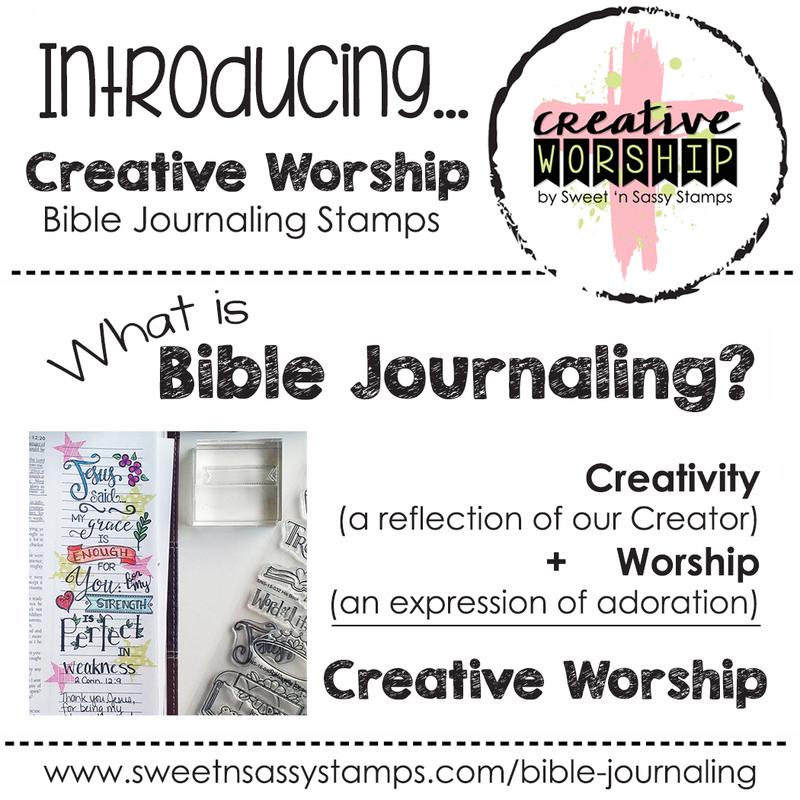 I'm back again as April's Guest Designer with Sweet 'n Sassy Stamps! the daffodil image in white on thick watercolor paper. for the flower and Peacock Feathers and Pine Needles for the background. with the last frame embossed in a basket weave pattern. color with your favorite medium! 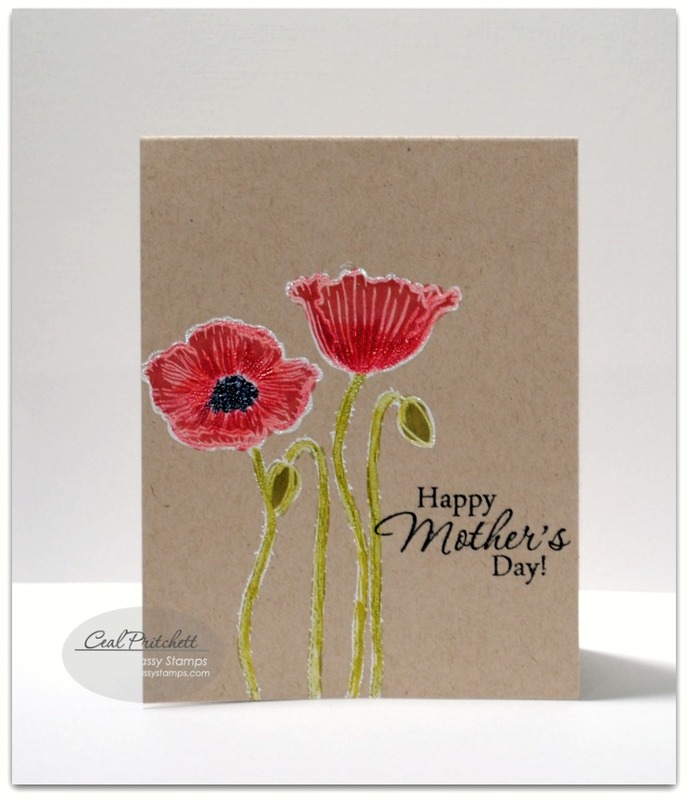 The Mother's Day sentiment is from Precious Poppies. next Wednesday for my last week as Guest Designer with SNSS! all you gal golfers out there. To begin, I stamped my image twice. over my water colored image for extra fun dimension. pretty DP with a water color look. available for Pre-Order right now! be found up on my blog. 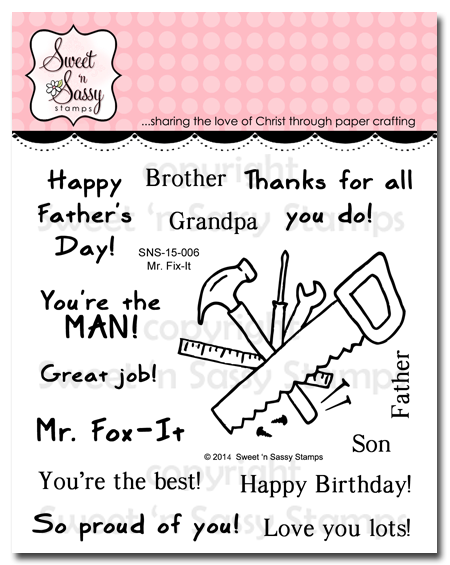 This month's Sweet 'n Sassy release makes it easy to create projects that our guys will treasure so I thought it would be fun to create a background for a masculine card. 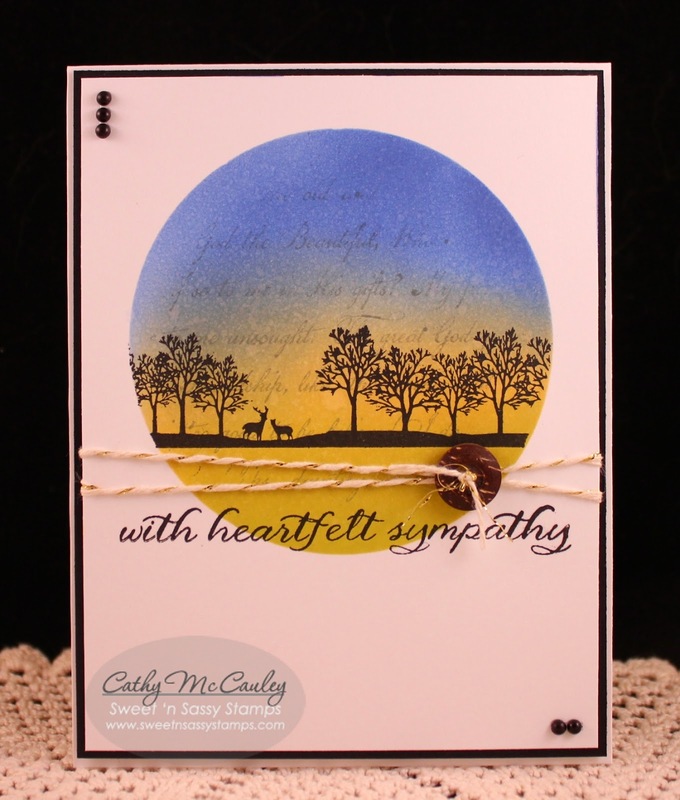 A Wood grain background was a natural choice to use with the"Mr. Fix-It" Clear Stamp set. Here's what you will need to create a simple wood grain background in just a few steps. I chose a kraft base, white craft paint and vintage photo distress ink for my background but many different looks can be achieved by changing bases, and/or paint colors! Paint with long strokes using a DRY brush leaving card stock peeping through. Score lines at random distances, horizontally along the painted layer then sponge distress ink in score lines. Using two different sized hole punches, punch a few holes in the "wood". For a look at this month's release please stop by our store HERE! 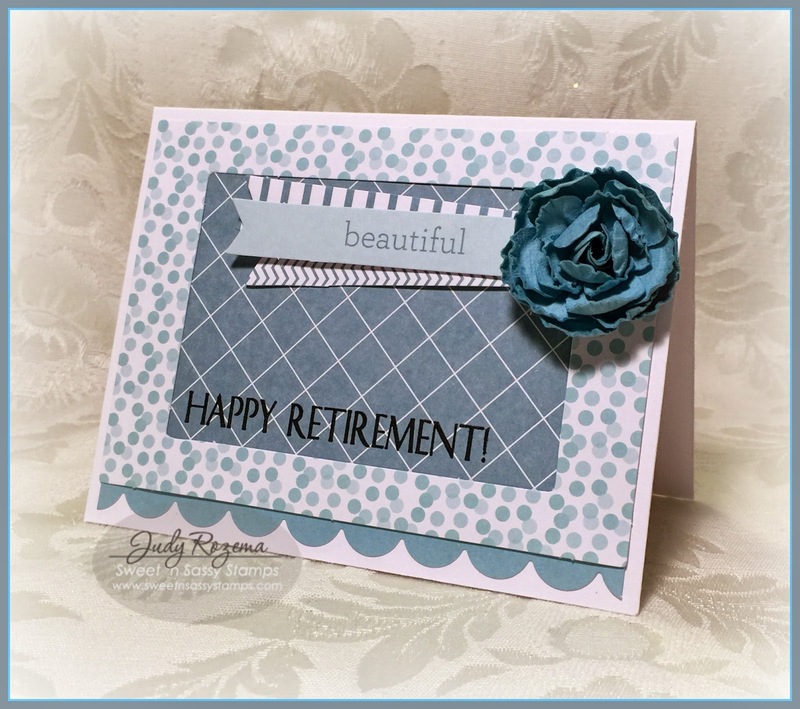 Since I had been a teacher most of my working life, and I am getting older (I retired from teaching in 2013), this new Retirement Sentiments set (available for preorder) is going to get a lot of use! I have a lot of friends who will be retiring this year and in the next few years. Today I made a quick and easy card using one of the sentiments from the set and some pre-cut shapes. The scalloped edge along the bottom is cut from some really sparkly blue paper (always hard to photograph) using the smaller die from the SNSS Scallop Border die set. Be sure to check out the rest of the April release here! Preorder our April 2015 Release Today!